WHAT TO DO IF YOU FIND A BABY BUNNY NEST IN YOUR GARDEN? I can’t tell you how often I have accidentally uncovered a bunny nest while in the garden. The nest is usually only an inch or so below the ground surface, tucked under a perennial such as lavender or asters, and only covered with a thin layer of the mother’s fur. If you find a nest, do not disturb. If you have accidentally disturbed the nest by raking or tidying up, place the fur back on top of the babies. If the baby bunny has been accidentally handled or touched, still return it to the nest. The greatest myth is that Mama Cottontail will reject the baby if handled by a human. This definitely is not true and the Mama will definitely want her baby back! Eastern Cottontail mothers do not stay with the nest all day. Rabbits are a prey species, in other words, they are hunted, and she does not want to draw attention to the nest. Cottontail Mamas typically return twice a day, at dusk and at dawn, to feed the babies. She nurses the babies by straddling the nest, so you want to keep everything as it was when you found the nest. If you are worried because you have not see the Mama return to the nest to feed the babies, lay two pieces of string over the nest in an X shape. If after twenty four hours the string looks disturbed and the babies look plump and well-fed, you can be sure that the nest is not abandoned. 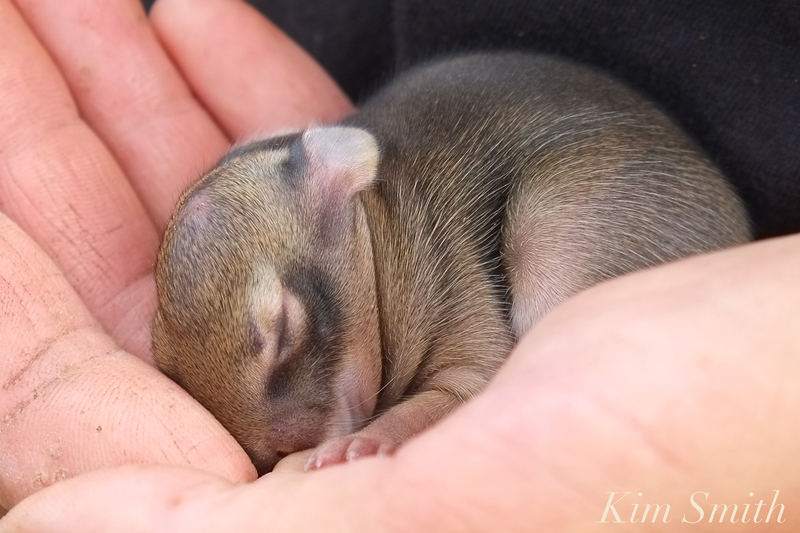 EDITED: To our Cape Ann readers- for bunnies and other small mammals that need rescuing I recommend contacting wildlife rehabilitator Erinn Whitmore. It has just been pointed out that Erinn Whitmore is away until the fall. Erin Parson Hutchings also does small mammal rehabilitation and she too is a Mass Wildlife licensed rehabber. You can contact Erin through facebook. 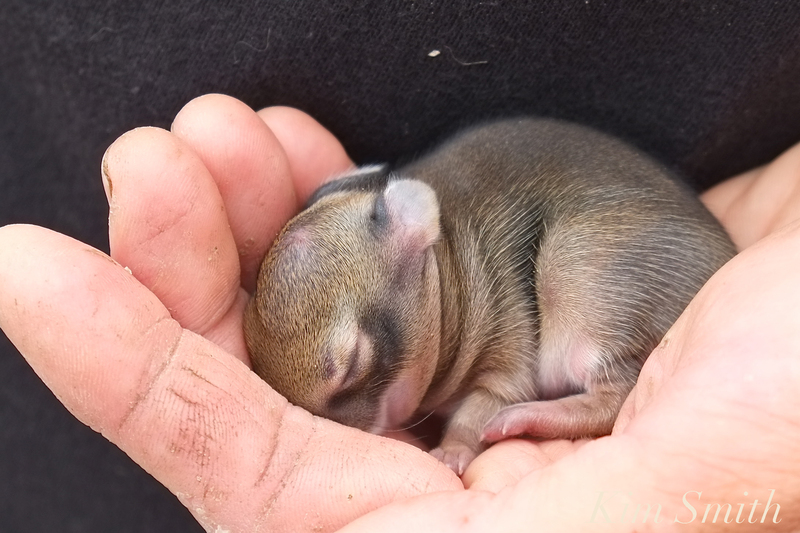 This tiny Eastern Cottontail was found today by Ari at Wolf Hill, in a nest located in some gravel. She accidentally uncovered the nest while tidying up around the plants. This entry was posted in Cape Ann Wildlife, Home and Garden and tagged Baby Bunny, baby rabbit, Eastern Cottontail, newborn rabbit, Sylvilagus floridanus, what to do if you find a rabbit nest, what to do if you touch a rabbit on July 17, 2018 by Kim Smith.